Ever wonder why some people seem to know what to do in any given situation? Ever struggle with decision-making yourself? 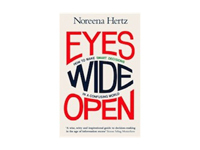 Enter Eyes Wide Open: How to Make Smart Decisions in a Confusing World by Noreena Hertz, an associate director in the business school at the University of Cambridge. The book takes readers through dozens of scenarios from the personal to the professional on a hyperlocal and global scale, using examples readers can learn from as well as tips on what to look out for. What’s impressive about the book is how considerate it is of our modern times. This book would’ve looked very different ten years ago. Hertz has put special thought into how the digital world impacts our decision-making and can lead us down the wrong road if we aren’t careful. The book includes ten steps from “Get to Grips with a World in Hyper-Drive” to “Embrace Dissent and Encourage Difference.” Highly recommended for anyone looking to improve decision-making and avoid the pitfalls when we don’t. Non-fiction is my daily staple and fall reading has provided some meaty options including Writing is My Drink: A Writer’s Story of Finding Her Voice (and a Guide to How You Can Too) by Theo Pauline Nestor – a good read for those looking to blog or write a memoir or simply journaling more truthfully. Confession: Mary Poppins is my all-time favorite movie. When Mary Poppins, She Wrote: The Life of P.L. Travers by Valerie Lawson arrived in the mail, I may have been so happy I floated to the ceiling a la the scene with Uncle Albert and the children when they’ve come for tea. The book “explores the events that inspired the major motion picture: Disney’s Saving Mr. Banks,” coming out this December starring Tom Hanks as Walt Disney and Emma Thompson as the author. Not only is the book a keeper for fans of Mary Poppins but for anyone interested in biographies behind iconic stories. Quickly we find many of the most compelling pieces of Mary Poppins were inspired by Travers’ real life. Extremely well written and executed. Heather Davis’, author of the #1 bestselling motherhood book, TMI Mom: Oversharing My Life, shares her adventures in romance with TMI Mom: Getting Lucky (after kids), in paperback ($13.95) and ebook ($4.99) releasing after Thanksgiving. Action adventure readers are treated to a second Timeshifters time travel novel in Cara Brookins’ Mark of the Serpent, releasing in paperback ($13.95) and ebook ($3.99) on Dec. 3. Malena Lott treats readers to a holiday romance with the novella, Sterling & Sloane, set in Manhattan’s upper west side during the holidays. The ebook only release will be available for $1.99 as a holiday special on Amazon and Nook on Dec. 10.